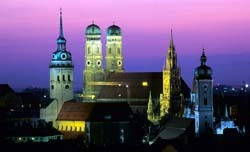 The presented room availability, rates and discounts are actual and final for all our 347 hotels in Munich. This is the busiest tourist spot in Munich. You will easily find shopping streets, various pubs and restaurants in this square. All of them will be in a walking distance from Marienplatz. However, the square itself contains many interesting objects, such as Glockenspiel chime on the front of the New Town Hall . The tower was built in the XIX century. When it’s 11, 12 and 21 hours, the chime is accompanied with a puppet show that is usually dedicated to different historical events. The New City Hall is decorated with an 85m tower. The tower provides a beautiful view of the old part of Munich. The top of the tower is the location of the mascot and symbol of the city - a small Kindl monk. The main church in Munich, Frauenkirche, is located in Frauenplatz near Marienplatz in the center of the city. Two 99-meter towers of the church have largely determined the look of today's Munich. The church was built between 1468 and 1488 in the Baroque style and is considered one of the best examples of the Bavarian architecture. By the way, not everyone is equally positive about the beauty of Frauenkirche. Some visitors consider the church too gloomy inside. However, in any case, the church is definitely worth visiting and making your own opinion about its look.